It’s now officially Spring, which means we see more robins. 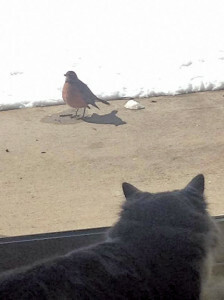 Jackie Gage, of the City of Cedar Springs sent us this photo of a robin visiting outside her window. Thank you, Jackie, for sending us your photos of Max the robin! Do you have a wildlife, Post Travels, Catch of the week, or other photo you’d like to send us? Email it to news@cedarspringspost.com. Include some information about the photo and your contact info. We will publish as space allows. Publication is not guaranteed.